The list below should answer most of your questions. If you can't find an answer here, please send your question using the form on our contact page. How do I choose a bag size? If unsure of the size of bag you need, feel free to contact us for help. To calculate the size of bag needed, start by measuring the items going into the bag. Bags can have gussets either in the side or bottom, but not both. The circumference of the bag should be larger than the circumference of the items going in the bag. This is generally only a concern when there is a specific size object needing to be bagged. Bottom gussets in bags will help the bag sit flat when expanded, but do not increase the circumference of the bag. for that same 9x6 box, a 16" wide bag with a bottom gusset of 6" will hold the boxes nicely. Bags measurements are expressed as the entire width x height (9x12, 15x18, etc) of the flattened bag. If bag has side gussets, the measurement is written as Width x Gusset x Height (12x7x22 is a standard T-shirt bag). If bag has a bottom gusset, the measurement is written as Width x Height + Gusset Width (15x18+4"BG for instance). It's important to understand that bags with side gussets always have a bottom seal, and bags with bottom gussets will have a side seal. Bottom Seal bags are sealed between 1/4" and 1/2" from the very bottom of the bag, while side sealed bags are sealed at the very side edges. All Dimensions are approximate. Length and width of bag vary within 1/2" ±. Larger bags can vary by as much as 1"
Gauge (mil) can vary by up to 10% ± from order to order and/or within the same order. Film and Ink colors may vary from order to order and/or within the same order. For multiple color prints, ideal trapping is 1/16" or greater. Image will shift slightly from bag to bag. Two sided print alignment can vary by up to 1" front to back. Artwork with screens will be printed at 35 LPI. Uneven ink coverage may result due to dot gain. Colors on proofs are approximate and may not display accurately on monitors or desktop printers. Inks are matched to Pantone PMS colors. Can you match film colors? We offer close to 30 different standard colors of film, in both HDPE and LDPE, so we can come close to matching most film colors. We do not provide custom film matches. Visit our Film Colors page to see all the colors we offer, downlonad our line card (PDF), or contact us to request film color samples. Are plate and setup fees charged on reorders? No. Plate charges are a one time charge. Additional charges would only apply if changes are being made to the art. We do not charge a setup fee on any orders. Plate charges are not charged if you provide your own plates. see our FAQ page about providing your own plates. Why do Minimum Quantities vary? American Plastic takes pride in being able to offer minimums as low as 3,000 bags, but depending on the specs of the bag, that minimum can end up being as high as 20,000. The reasons for this mainly have to do with setup times, labor, and waste. Setup for all jobs takes about the same amount of time, regardless of the size of the bag. There are three basic steps involved in making bags: extruding film, printing, and converting individual bags. Extruding Film - This involves loading an extruder with raw resin, melting it, and blowing it into a tube of the specified width and thickness. Before being wound on a roller, the blown film needs to be threaded through a set of rollers, and adjustments made to width and gauge of the film. This process is the same no matter how much material we are making. So for smaller orders, the percentage of setup time compared to the whole run is much higher. On larger runs, the setup time is a very small percentage of the time it takes to run a job. Printing - Printing setup is also time consuming, and that multiples for each ink color added. Many one color jobs can be printed inline, as the film comes off the extruder, but for bags printed offline, or with more than one color, the film is transferred to a separate printing press. Each color requires its own printing plate, attached to a printing cylinder. Usually workers need to change out the print cylinders to match the bag size being made. The only way to register multiple colors so that they line up correctly is to print some film and make final adjustments as it runs through the press. Running a six color job can require hours of setup time, which makes smaller runs very impractical. Converting - The final step in making bags is moving the printed (or unprinted) film to a machine that cuts, seals, and stacks the bags. There is setup time required to wind the film through the converter, adjust digital print sensors, and ensure seals line up properly. Total weight needs to be at least 100 lbs to justify the setup processes involved. Because of the complexity of the manufacturing process, we may refuse to quote some jobs if we are unable to offer a competitive price. The short answer is no. American Plastic, Mfg sells exclusively through a network of distributors. This allows us to keep our prices low by focusing on our production process. Our distributors are knowledgeable about our capabilities and product line, and can suggest products that would be well suited for your business. Please let us know if you would like more information or have questions, or if you are a bag distributor and are interested in setting up an account. Do you provide sample bags? Yes, we are happy to provide individual samples of our products. However, because everything we make is a custom job, and that we offer a large variety of sizes, film colors, bag styles, and thicknesses, we only provide samples for specific orders. Distributors often ask for "sample packs" containing general samples of all styles in different sizes, colors, and mils, but those are simply not practical for us to assemble, since what would be included would be a limited selection of what we can make. Our line card and website shows all the different handle sizes and film colors offered. Film swatch books that contain all of our film color options are also available to distributors. Plastic bags are printed using a process called flexography, which uses a flexible relief plate to make imprints. Each color of the print job requires its own plate. We can print a total of up to six colors, combined between both sides of the bag. 6 colors on one side, or 3 colors on each side. Flexographic plates can usually be used for many years without any degradation. However, after long use, the plate surface can develop cracks which will affect print quality. When plates do develop cracks, we recommend replacing the plates. When ordering plates through us, we will replace any cracked plates free of charge. Our manufacturing process is fairly simple. Film is extruded by heating small resin pellets and blowing the film into a tube, which is then wound onto a large roll. The roll of film is then wound through rollers on the press where it is printed, and then rolled up again as it comes off the machine. The next step is converting the film into bags. Different converting machines make different types of bags. How do I specify ink colors? Inks are matched to standard Pantone PMS colors found in the Pantone Plus Formula Guide. Coated (C) and Uncoated (U) inks with the same PMS number may appear different both onscreen and when printed. American Plastic only prints with coated inks. When creating your art, we strongly suggest referring to a PMS guide to specify colors. PLEASE NOTE that printed colors may shift slightly from order to order, and within orders. While we strive for color consistency, exact color matches cannot be guaranteed. Art programs like Photoshop, Illustrator, Corel Draw, and others allow you to select colors from various palettes, and you should be able to select the Pantone Plus Coated palette to design your work. We will always provide a digital proof of your art in the colors specified, but keep in mind that colors may not look the same on screen, or printed on paper from desktop printers. Can you provide an ink drawdown? We do not offer ink drawdowns for a couple of reasons. We match all ink colors to standard Pantone PMS colors. Because of the large number of possible ink colors (close to 2000), accurately mixing small amounts of a ink is very time consuming, and it's difficult to make in small batches with precision. The other issue with drawdowns is that the method for rolling it on the film does not accurately replicate the way ink is applied on the printing press, so it isn't always possible to get an accurate representation of how the ink will look. We match all colors to standard Pantone PMS color numbers. The best method of choosing colors is to refer to a PMS color guide. We stock coated inks only, so refer to PMS "C" colors. For more information about choosing colors, please visit our FAQ page on specifying ink colors. If you are choosing a film color other than white, see our information about printing on colored film. How do you print halftone screens? Halftone screens help to achieve the look of a lighter shade, or shades, of whatever color ink is being printed. However, there are some limitations of printing art like this. See images below for samples of how screens look when printed. Because of the large size of the dots used, we do not recommend printing small text or thin lines as screens. When using screens in your designs, it is best to use them for larger, solid areas. Screens also will look better on larger art. Just as the 4pt line above looks much cleaner than the 1pt line. Can printing plates be reused? Yes. Printing plates can generally be reused many times. It's not uncommon for plates to last for ten years or longer, and through millions of impressions. If the time between orders using a set of plates is longer than about 4 years, we archive the plates. After ten years past the last order date, plates are disposed of. We recommend ordering plates through us, although we can usually use plates made elsewhere. There are lots of advantages to order plates through us, as explained in our post about providing your own plates. Flexographic printing plates can get expensive, but will usually last for years. Eventually, plates will begin to develop cracks. If the plate was purchased through American Plastic, the replacement plate will be made at no charge. How do I prepare and submit Art? All art should be submitted electronically, either through email, or by providing us a link to download the art. Contact us for information about where to send art. Preferred file format: PDF. Files should be unlocked. Our artists need to be able to open and make adjustments to art files. Acceptable file formats: EPS, AI (CS5 or earlier), and CDR (X7 or earlier). NOTE: If sending art in these formats, please provide a PDF proof, and convert all text to curves, and outlines to objects. File formats that will incur art charges: TIFF, JPG, PSD, and PNG bitmap image files must be converted to vector for printing. Printed Art received by mail or fax will need to be converted to digital vector files. Art charges will apply. Halftones and gradients are printed at 35-lpi, and should be limited to larger areas for best results. TRAPPING - Film shifts up to 1/8" during printing and can cause registration issues. On multiple-color jobs, leave white space between colors if possible. If colors must overlap, trapping should extend by at least 4pt. When setting trapping, be aware of the print order: lighter colors print first, followed by darker colors, and black will always print on top. If unsure of the order that colors will print on your job, please contact us. Can Bitmaps be converted to vector art? Yes, but not always easily. Depending on the complexity of the image, converting bitmaps to vector art can be simple or very time consuming. Many times, art can be electronically "traced" in a vector art program. Tracing doesn't work very well with small text and small details can get lost. Converting more complex, or multiple color bitmaps to vector art sometimes requires rebuilding the art from scratch – matching fonts, and redrawing lines. Placing a bitmap into an illustration program and saving as an EPS or PDF does NOT convert the file to vector. We can usually convert your art for you, but art charges may apply. How do I Convert Fonts to Outlines? A font is a collection of letter defined as a specific typeface. The font file contains mathematical descriptions of the shape of each letter. Fonts can only be edited on computers where the font file is installed. PDF files can have embedded fonts, which will display and print properly, but cannot be edited by computers that don't have the font file installed. When opening the document on a machine that doesn’t have the proper font installed, programs usually substitute another font. Obviously, this can cause problems. Converting fonts to outlines disconnects the font descriptions from the letters, and prevents the shape from changing. The downside of this is that once the type is converted to outlines, it can no longer be edited as text. To convert text to outlines, an illustration program like Adobe Illustrator or CorelDraw is required. Adobe InDesign is also capable of converting type to outlines. In Illustrator or InDesign, chose “create outlines” from the Type menu. In CorelDraw, select “Convert to Curves” from the Arrange menu. What is the difference between DPI, PPI, and LPI? 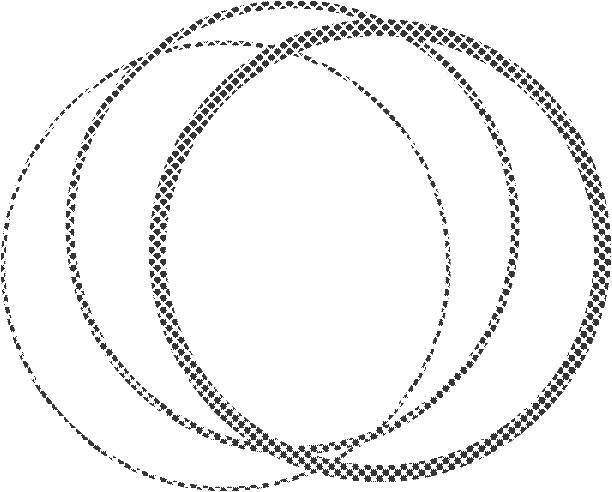 Both digital bitmap images and printed images are made up of a series of dots. The terms DPI and PPI are usually confused these days. DPI – Dots Per Inch –the resolution of a printed image, how many tiny dots of ink printed per inch. The more dots, the finer the print. LPI – Lines Per Inch – refers to the lines of in a halftone or screen - the higher the number, the smaller the screen. These dots are not the same as those defined by in DPI. DPI and PPI when referring to a digital image are fairly meaningless without knowing how many inches an image is. The image resolution is determined by the number of pixels in an image. An image that is 10" wide at 300dpi is 3000 pixels wide, could also be defined as 100" at 30dpi, or 1" at 3000dpi. In printing, DPI is the number of dots of ink per inch, and is generally a higher number than the image PPI, and the PPI is a higher number than the LPI. For most commercial printing applications, digital images need to be a minimum of 300 PPI at full size. If there are image areas that will be printed as halftones (not a solid color), the LPI indicates the number of lines of dots per inch. For many print applications, LPI is approximately half the number of the PPI. For the process that we use for plastic bags 35 is the maximum LPI that prints well. This produces fairly large dots compared to offset printing. As an example, most newspapers print images at around 80 LPI, and most magazines at around 150 lpi or higher. What if my art doesn't meet your specifications? After we receive your art, we inspect it to make sure it will print well. If we see any issues with the art, you will be contacted with information about the problem. Common issues involve embedded fonts, incorrect trapping, thin outlines, too much halftoning, and low resolution bitmaps. If you are unable to correct the issues, an art quote will be provided. I don't have an illustration program, how do I submit art? If unable to create your art in an illustration program, you will probably need to hire a graphic designer to do the work for you. We do provide design services. If you would like us to prepare the art, let us know and we will give you a quote. We provide a digital proof and mockup of the art in PDF format for all new orders. The PDF will show both a proof of the art at 100% size, as well as a mockup of the art on a template of the bag. Mockups and proofs are not provided for reorders except by request. Pre-production samples are not available. See this link for more information. Do you provide physical mockups? Before computers and the internet, proofing was done by printing the art on a piece of paper and taping it to a bag. Ah, those were the days. There are several problems with proofing this way - it's far less efficient than emailing a digital proof, costs more in terms of time and money, cannot be depended on for color or print quality accuracy (since it is a completely different type of printing), and doesn't really provide any benefits over a digital proof.